After tasting at C. Donatiello, we scooted next door with Chris to try the wines from Bradford Mountain Winery. The label is produced on the C. Donatiello property with the tasting room also located behind the C. Donatiello tasting room. It’s a little difficult to spot, but a few people wandered in while we were there. Chris jumped behind the bar to pour for us and tell us a little about the winery. 2007 Healdsburg Ranches Chardonnay: Pear, green apple, crisp, cool, lemon, tart, tropical notes. 2005 Bradford Mountain Dry Creek Valley Zinfandel: Spicy, pepper, black cherry, blackberry, juicy, black fruit. 2005 Bradford Mountain Grist Vineyard Zinfandel: Oak, cedar, spice, perfume, red fruit, big juicy fruit, pepper, tart berries. 2005 Bradford Mountain Grist Vineyard Syrah: Oak, spice, white pepper, violets, dark, tannic, juicy, black plum. 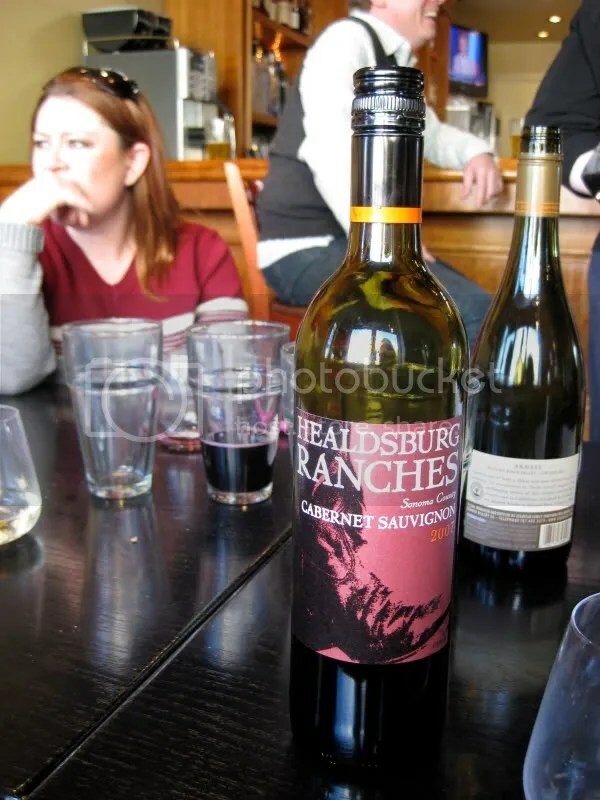 2007 Healdsburg Ranches Cabernet Sauvignon: Pepper, green peppers, black fruit, mint, herbs, tart fruit. 2005 Bradford Mountain El Grandote Dry Creek Creek Valley: Blackberry. syrup, blue fruit, chocolate, nice structure. My favorite. 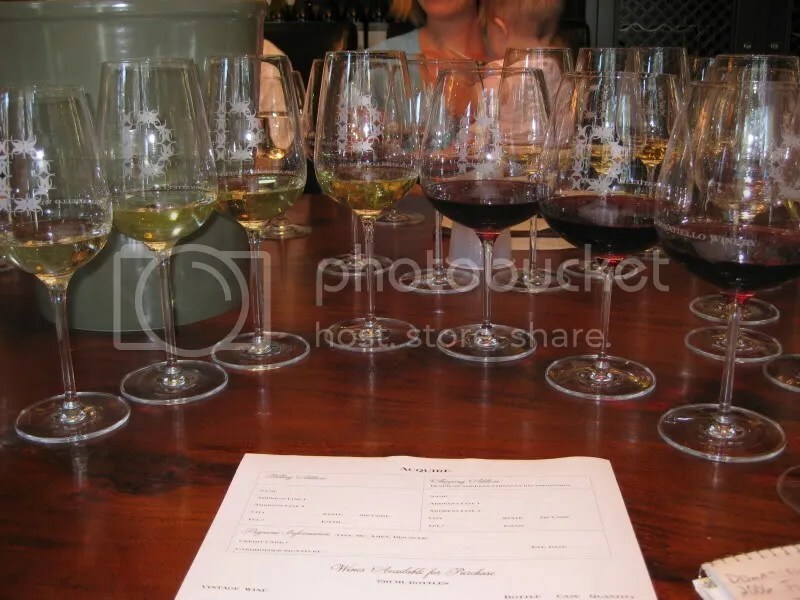 I’ve tried some of the Bradford Mountain wines last year when Chris sent them to me as samples and I thought you could really see the winery finding a style as the years went by. 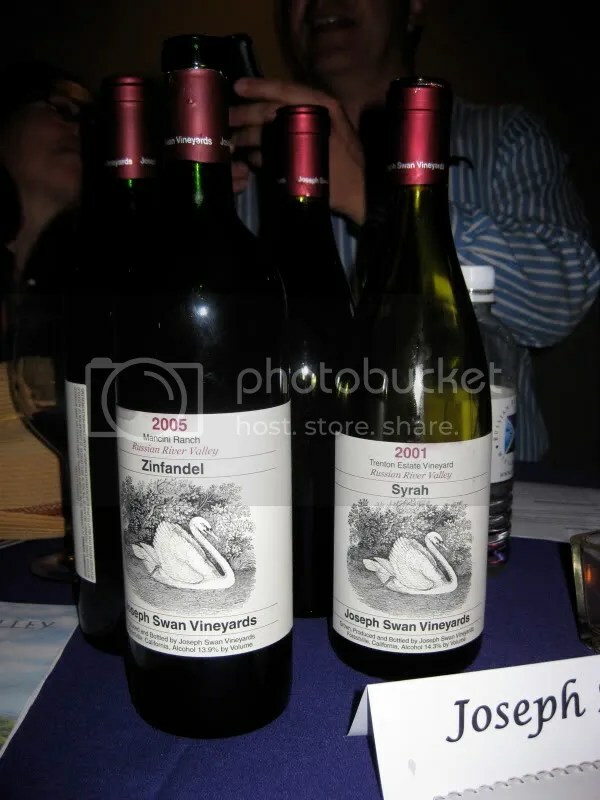 My favorite out of those was the 2005 Syrah, which I also enjoyed again at this tasting. I actually still have one set of Zins in my basement that I still need to try, I left them down there to see what a year of age would do to them. I’ll haul them out soon and report back! After the Wine Blogger Conference, Thea, Ashley, & I did a whirlwind tour of Sonoma and Napa. And I really do mean whirlwind….on one day we did both Sonoma and Napa in the same day and STILL managed to stop by to see Patrick and Genevieve and their adorable new son. Our first stop after lunch was a must visit for me after I learned of this winery at last year’s WBC. Oh, and by the way, I still adore those glasses and am now the proud owner of my own pair…you might have seen them popping in pictures over the last 8 months or so! 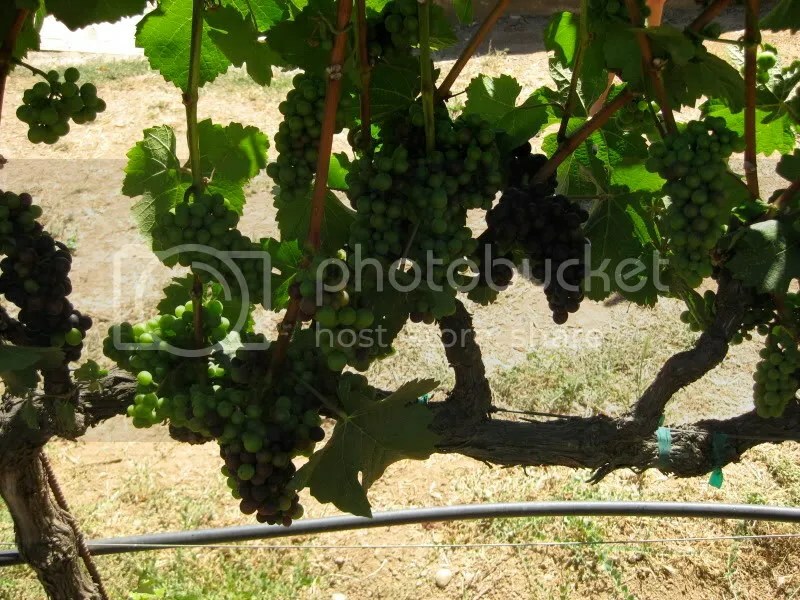 I’m talking about C. Donatiello Winery. If you haven’t been here before, go! 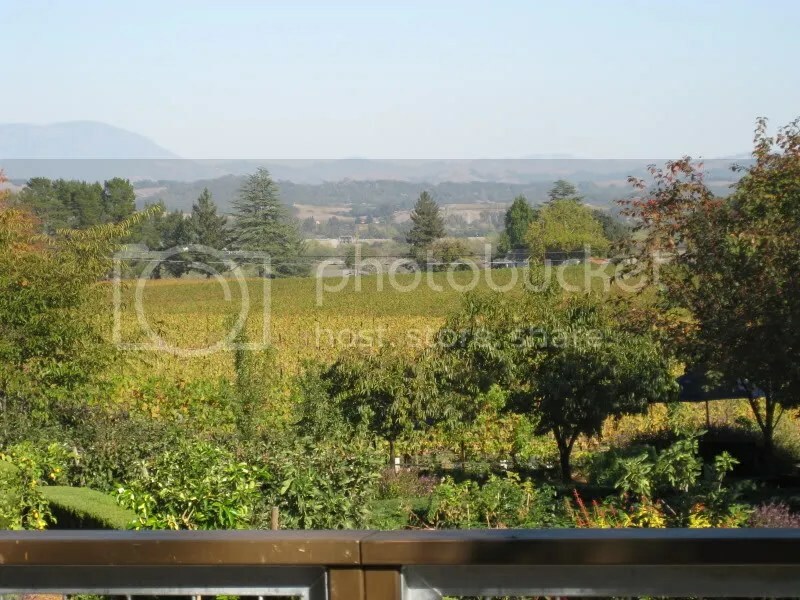 Not only are the wines great, but the grounds are worth a trip on their own. 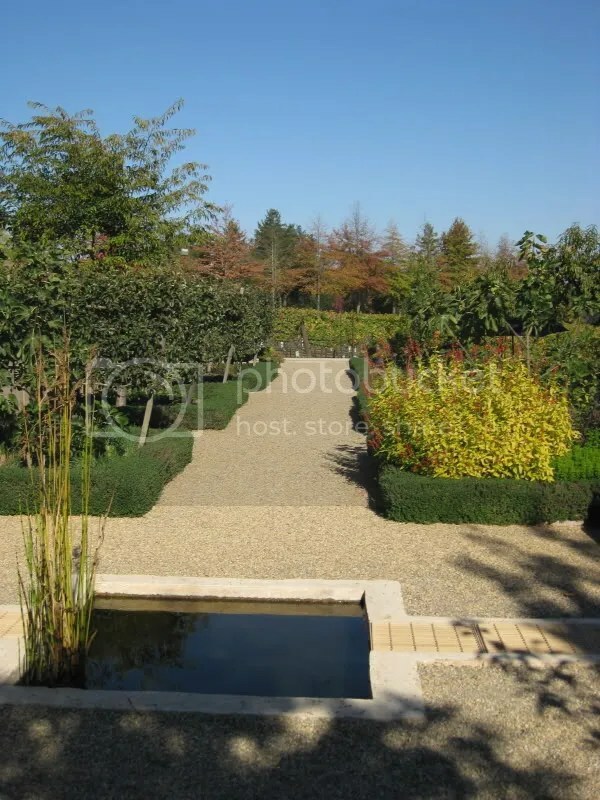 I wrote last year all about the aroma garden, which we toured again this year. I found it interesting to see it 3 months earlier in the year since so many different things were in season….I even got to eat some fresh raspberries right off the bush. However, before touring the facilities (still the CLEANEST winery facilities I have ever, ever visited) we got to sit down for a private tasting with Chris Donatiello. 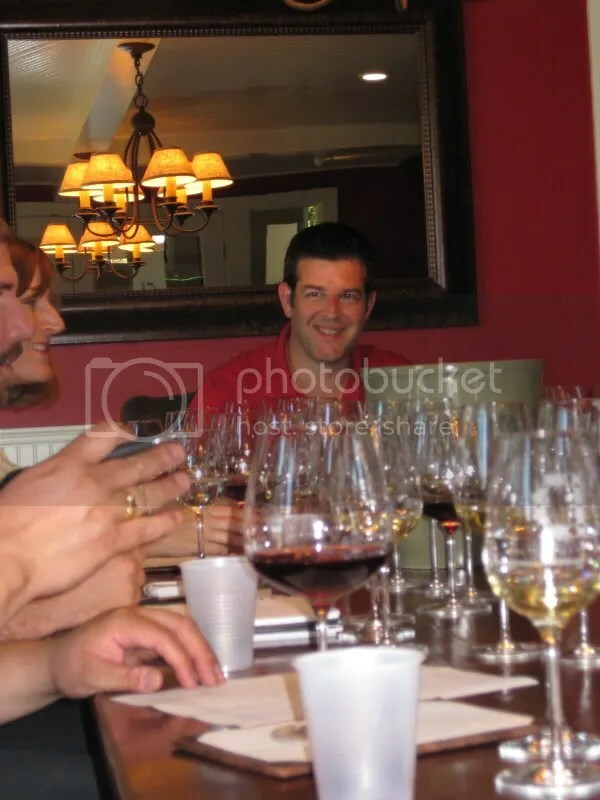 Chris is one of the most animated people I’ve ever seen when he’s talking about his wines. 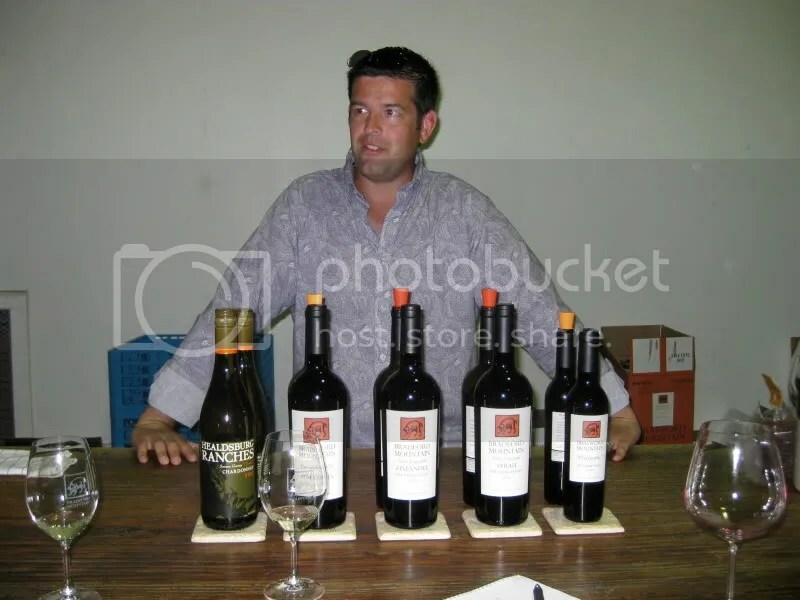 It’s hard not to catch his enthusiasm as he talks about his winery and winemaking and everything else that goes on at the estate. I think Thea and I may have been the only repeat visitors from last year’s blogger visit to C. Donatiello, but we were happy to spread the word to all our new friends and bring them along with us! 2008 Russian River Valley 809 Clone Chardonnay: $32. Lemon, pear, apple, fairly crisp, nice fruit, lemon, citrus, nice acidity, spice, stone, peach. 2006 Russian River Valley Chardonnay: $28. Spice, little bit of wood, cream, apple, golden apple, little chewy, nice fruit, round, spice. And flowers. Which I swear smelled like chocolate. 2007 Orsi Vineyard Chardonnay: $38. Cream, much rounder, oak, tropical, green apple, tart pear. 2006 Russian River Pinot Noir: $48. Cherry, spice, herbs, raspberry, tart, cranberry, spice, tannins, little pepper. 2007 Floodgate Block 15 Pinot Noir: $55. Black cherry, pepper, spice, raspberry, fruit forward, spice, on the finish, red fruit, tannic. 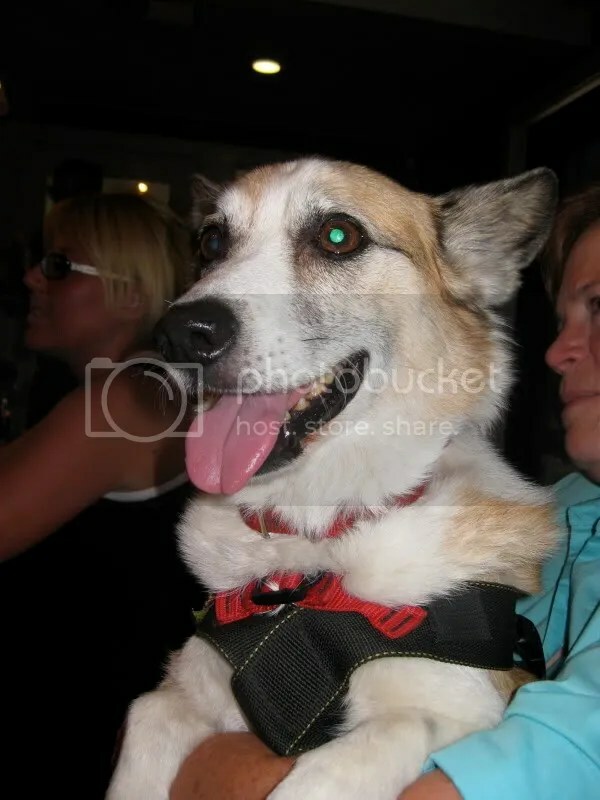 Even Twitter celebrity Wine Dog made an appearance! I highly recommend a visit to C. Donatiello next time you are in the Russian River Valley area. Make sure you leave some extra time to enjoy the beautiful grounds, and don’t be afraid to taste and smell things from the aroma garden…that’s why it’s there! 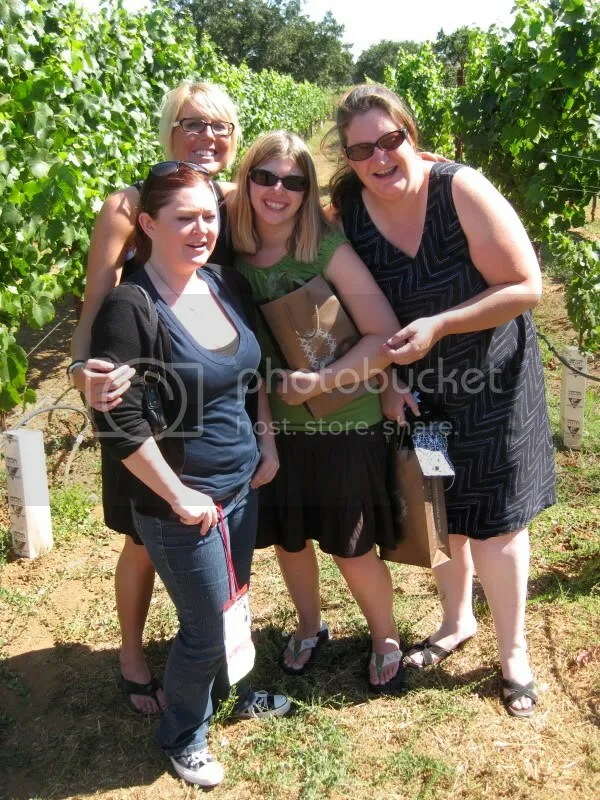 Shana, Ashley, Thea, & I pose in the vines. On the first night of the Wine Blogger Conference, the Russian River Valley Winegrowers hosted an “after” party. This was probably one of my favorite events of the conference this year. I’ve been really enjoying many of the wines I’ve been seeing coming out of the Russian River Valley recently, so I had hoped to try many different things at this tasting. 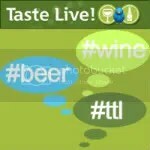 Alas, it was late at night, palate fatigue eventually settled in, and I didn’t get to taste as much as I had intended. A good excuse to head back to CA, right? 😉 What I did taste was worth the effort, and many of the wineries had the owners and/or winemakers present to chat with us, which is always a fun time. 2006 Acorn Sangiovese: strawberry, bright fruit, pepper, spice, earth, leather, red fruit, raspberry, cherry, nice acidity, spice. 2006 Acorn Cabernet Franc: deep strawberry aroma, fresh raspberry, spice, bright, red fruit, pepper, blue fruit, tannins. 2006 Acorn Axiom Syrah: Red berries, fruit forward, cedar, spice, raspberry, creamy fruit, round, pepper, floral, roses, red fruit, strawberries, tannins. 2006 Acorn Heritage Zinfandel: Smoky, pepper, blackberry, spicy, chocolate, red berries, bright fruit, nice fruit. 2007 Freeman Russian River Valley Pinot Noir: Leather, funk, eucalyptus, mint, herbal, raspberry, dirt, black currants. 2007 Freeman Keefer Ranch Pinot Noir: Dirt, earth, berries, red fruit, raspberries, little barnyard, tart red fruit. 2006 C. Donatiello Russian River Valley Pinot Noir: Fantastic nose. Brown sugar, raspberry, black cherry cola, vanilla cream, herbs, slight milk chocolate, red fruit, nice structure. 2001 Joseph Swan Syrah: Perfumey, violets, very aromatic, roses, deep black plums, spicy, meaty, chewy, anise, pepper, plums, smooth, integrated. 2007 La Crema Russian River Valley Pinot Noir: Smoky, pepper, raspberry, cranberry, cola, floral, vanilla cream, bright red fruit, tart fruit. 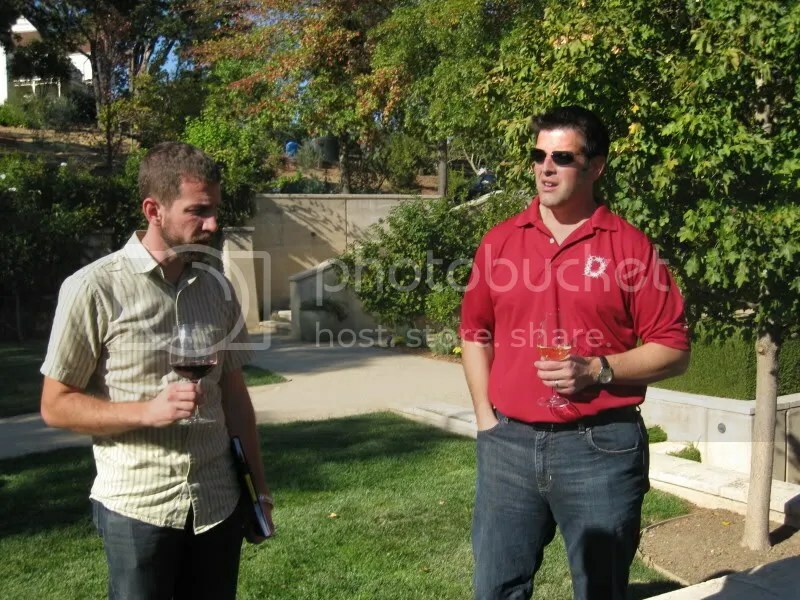 I missed many of the wineries that poured at this event. However, it was markedly less crowded than the Sonoma Grand Tasting earlier in the day, which I would guess was related to it starting at 10pm. I stayed to the end, but I got caught up talking to folks so I didn’t work my way as diligently and rapidly through the offerings as I normally would have. All in all, a nice line up of wines and a good incentive for me to spend some more time in the Russian River Valley. Patrick kindly organized a happy hour while we were visiting for our first night in town at the Healdsburg Bar and Grill. This made me extremely happy as I still couldn’t get their truffle oil parmesan cheese fries off my mind. So GOOD. Matt and I ate two baskets and I got to have the very adult mac and cheese. I love mac and cheese very much and never miss a chance to have it….as I seem to be incapable of making it myself for some reason. Over the course of the evening, quite a crowd came by to say hello and socialize for a bit. 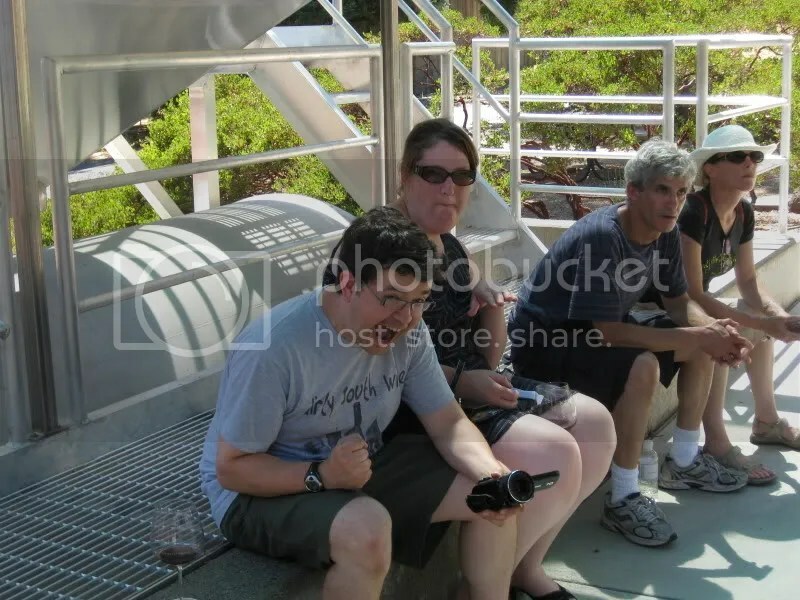 We saw Patrick, Genevieve, Penny, Chris, Jeremy, Shana, Robert, and others. Penny and Chris both brought wines to try (yay!) which I happily did. 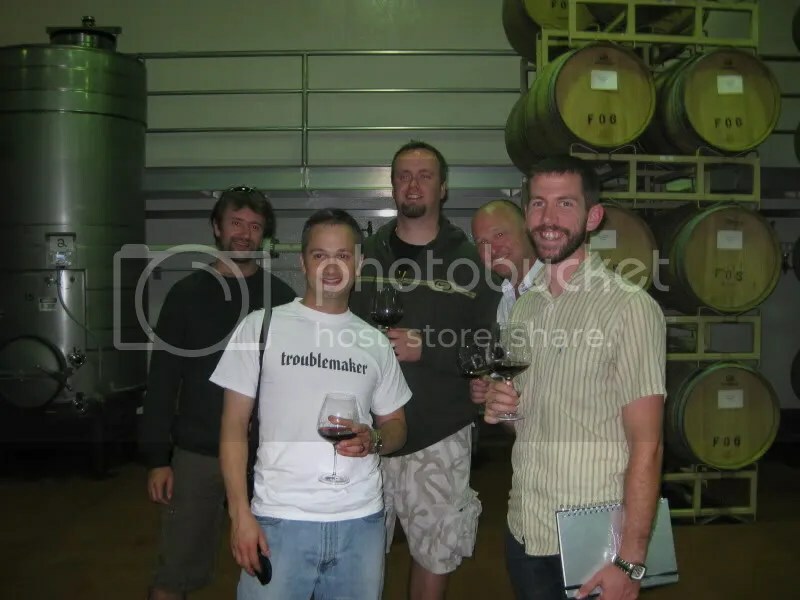 From Penny, barrel samples of her newest Tempranillos….she’s going to make two for 2008! 2008 Coral Mustang Vista Creek Tempranillo: Dark, berries, vanilla, spice, jam, plum, currants, grat dark fruit. Looks to be a good one, though it clearly won’t be released for a little while! 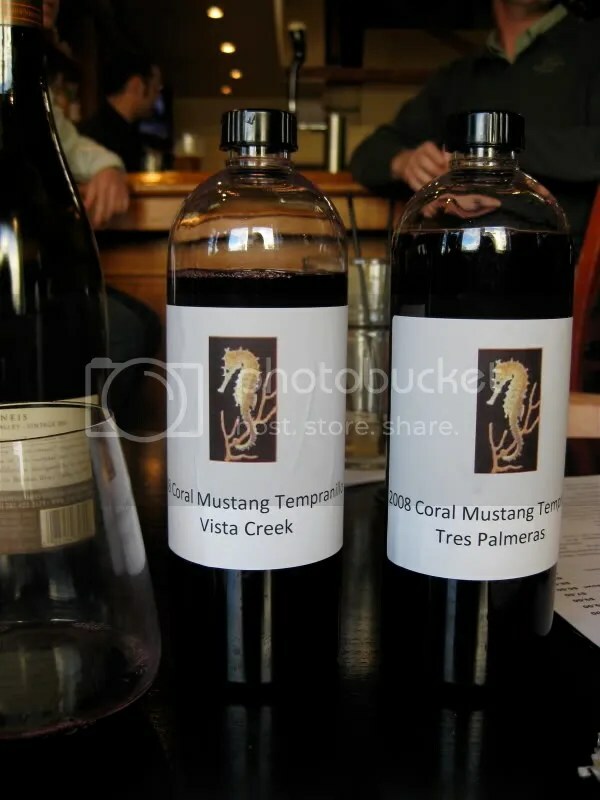 2008 Coral Mustang Tres Palmeras Tempranillo: I slightly preferred this one. It was lighter in color and flavor. I found spice, red currants, red fruit, cedar, nice structure, nice acidity, raspberries. This one will make a fabulous food wine. Chris brought along a bottle from a new line they will be releasing that will retail for around $14-$15. 2007 Healdsburg Ranches Cabernet Sauvignon. Screw cap, Sonoma County, 13.9% alcohol. Mint, leather, herbs, spice, herbal, black currants, anise, black fruit, some red fruit around the edges, nicely done for a $14ish Cabernet! All in all, a lovely evening catching up with old friends and making some new ones. It’s always great to meet new people, and I love the feeling that when we go out to CA we have so many folks to visit, yet we aren’t even from Northern California (though Matt is from Southern California….). Happy Valentine’s and all that jazz. I’m not really a big Valentine’s person, but I thought I’d give you a Rosé for the day anyway! We chose the 2007 C. Donatiello Rose. I got this bottle after attending a tasting at C. Donatiello this past fall…so I’m not sure if I should add my standard disclaimer since it wasn’t sent to me as a sample or offered to me as a sample, it was more like a party favor 🙂 Anyway…this wine is not available for purchase. C. Donatiello makes it exclusively for their wine club (and friends I guess!) which makes me even more inclined to want to join their club…hmmm…wondering how I can convince Matt that I NEED more wine…the label doesn’t contain much info, but if I had to guess, I say it was a Rosé of Pinot Noir, since C. Donatiello only makes Pinot Noir, Chardonnay, and Sauvignon Blanc! The wine clocked in at 14.5% alcohol by volume and had a real cork closure. On the nose I found cranberry, strawberry, cherry tarts, flowers, lime, and spice. As I drank this wine, I remembered walking in C. Donatiello’s incredibly cool aroma garden and I would love to take a glass of this Rosé and wander around there again. In the mouth I found strawberry, raspberry, slight cream, and some racy citrus…I would almost say lemon. I thought the wine showed as slightly creamy, but the fruit came through really tartly. I found the wine to be quite refreshing and it made me long for summer when I can make use of my backyard for BBQs and just lounging on the porch. 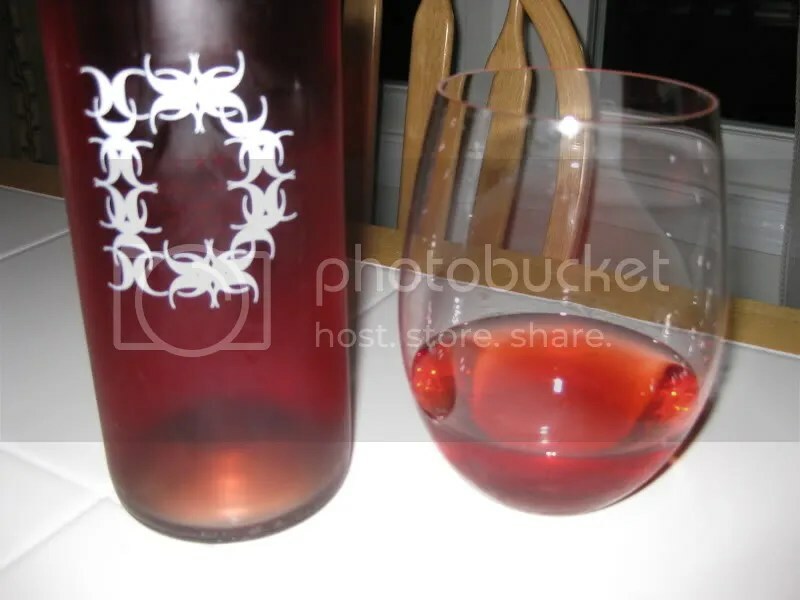 Actually…this Rosé would be excellent with some spicy BBQ! 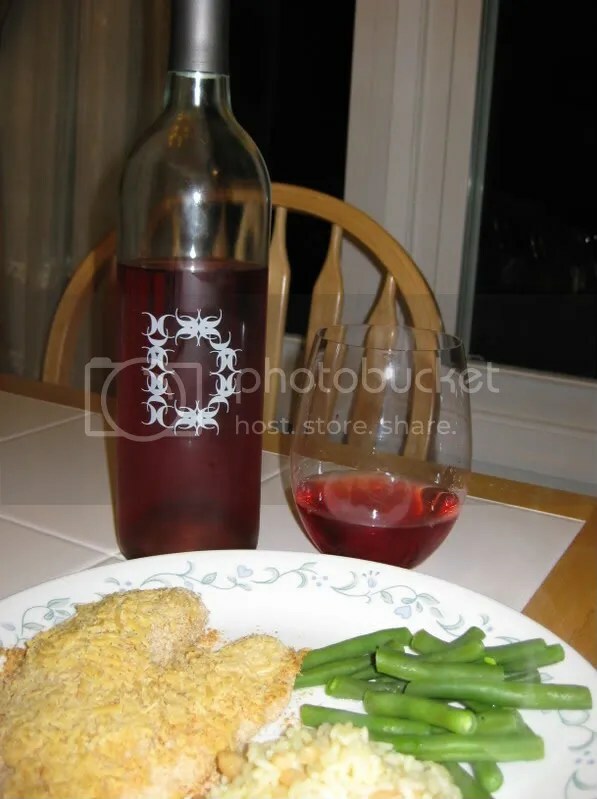 Though I served it with parmesan crusted baked Tilapia…despite what they say over at Another Wine Blog, I love Tilapia…it’s inexpensive and you can dress it up or down. I find it versatile and it goes quite nicely with a crisp Rosé. I don’t usually obsess over wine glasses. However, the Pinot Noir glasses at C. Donatiello were a thing a beauty. I want to drink Pinot Noir out of them all the time, they were just perfect. Really, I want one. Anyone know what this glass is and where I can get them? Please? 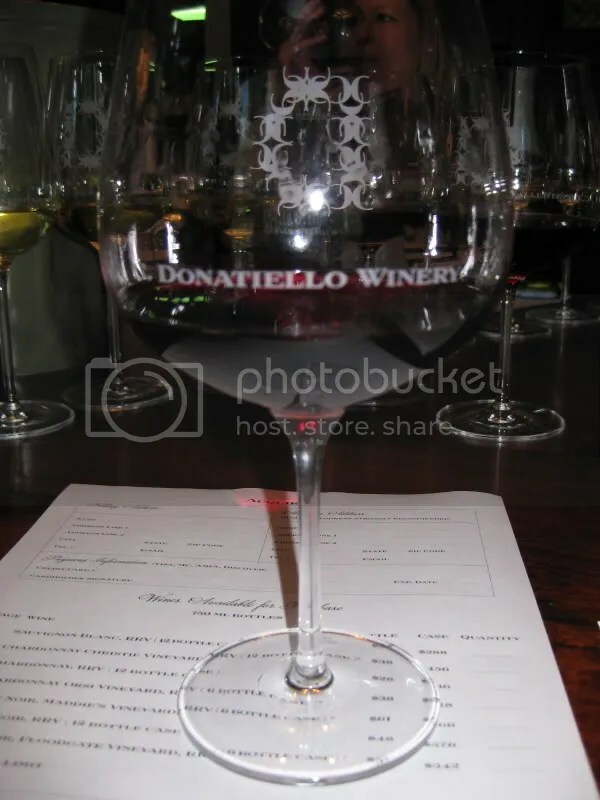 Okay, now that we’ve gotten that out of the way, after the Wine Blogger Conference, I got an invitation, along with a bunch of other folks, to head out to C. Donatiello to taste through their wines and get a tour of the facility. C. Donatiello is a relatively new winery, however, it took over the former home of Belvedere in the Russian River Valley. 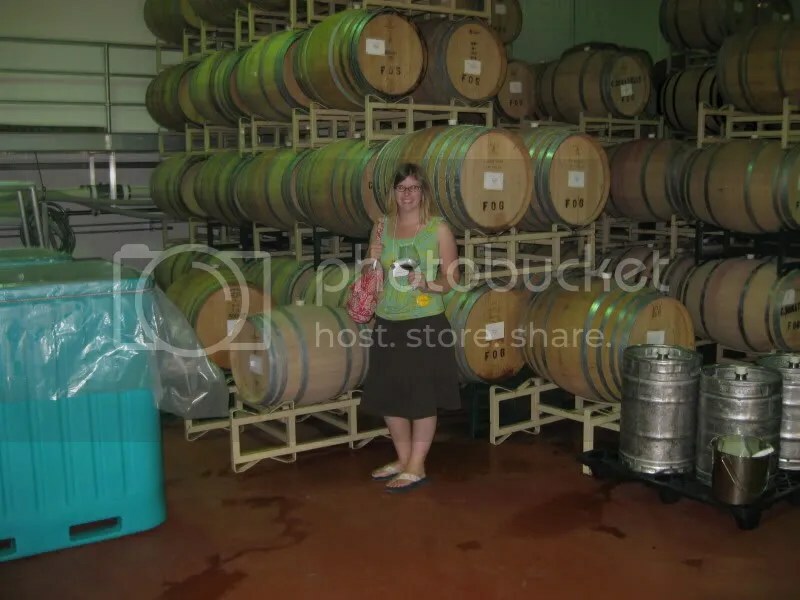 And it replaced it with what had to be the cleanest winery facility I’ve ever seen. 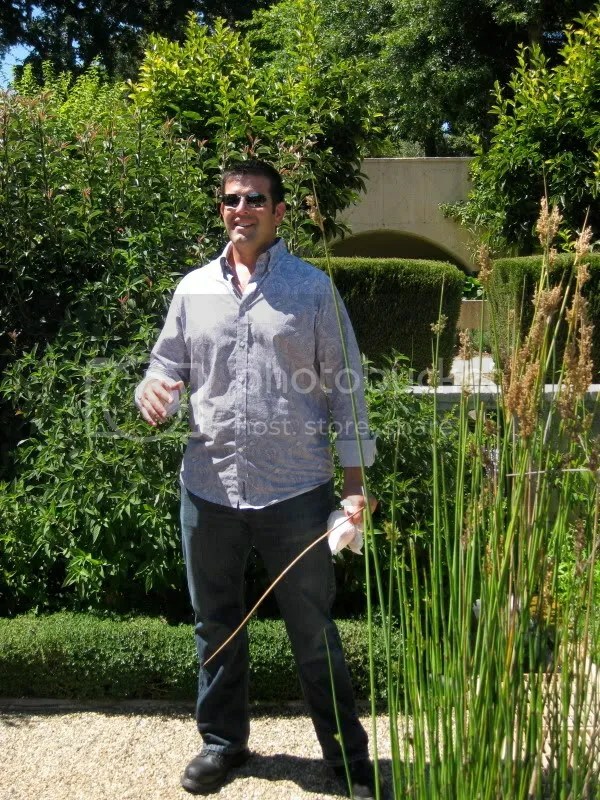 The crush and fermenting spaces sparkled, the gardens were manicured to perfection, and the tasting room was gorgeous. 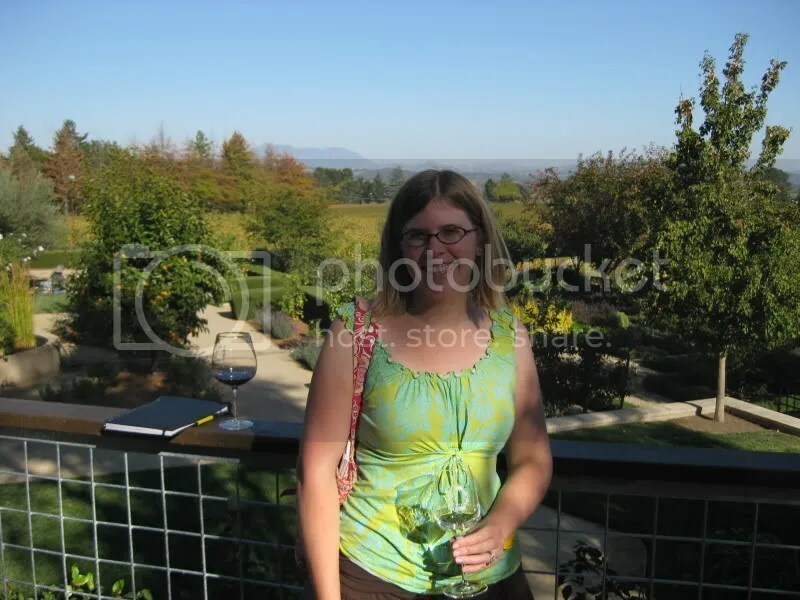 I can’t wait to take Matt there on our next Sonoma trip. 2007 Russian River Valley Sauvignon Blanc: $24. Neutral French oak. Pineapple, tropical fruit, grapefruit, crisp, dry, stonefruit, great acidity. Really liked this one. 2007 Christie Vineyard Russian River Valley Chardonnay: $38. 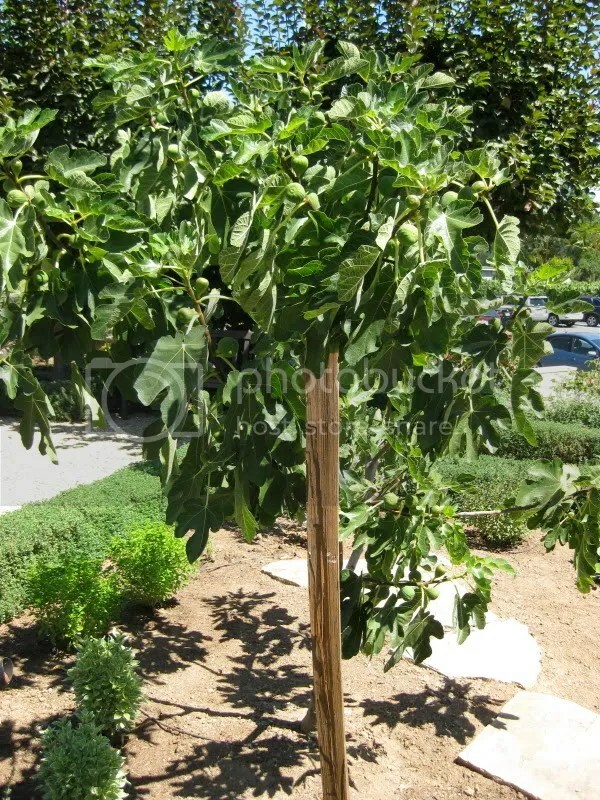 Neutral French oak. Toast, green apple, stone, lemon, other citrus, peach. 2006 Russian River Valley Chardonnay: $28. Butterscotch, lemon, celery? Wasn’t a fan of this one. 2006 Orsi Vineyard Russian River Valley Chardonnay: $38. Stones, mineral, lemon, very light. 2006 Floodgate Vineyard Pinot Noir: $57. 30 year old Pinot Noir vines. Tobacco, herb, cherry, rose petal, earth, forrest, ripe red raspberries, red fruit, leather, fabulous structure. 2006 Maddie’s Vineyard Pinot Noir: $61. Mint, menthol, tannic, leather, tart, cherries, raspberries. I took this glass with me for our tour as I thought it had a ton of potential. 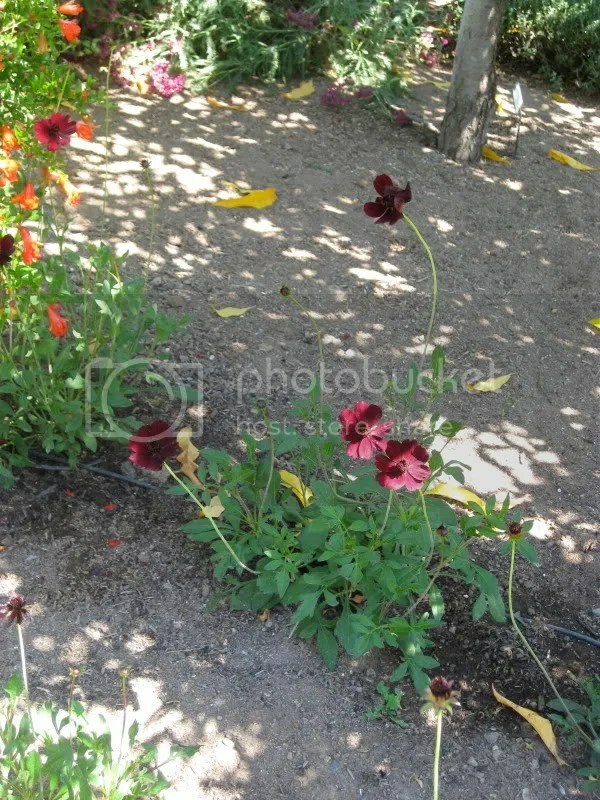 I was right, as I swirled it and sipped it on our walk through the facility and grounds, it opened up beautifully. I bought one to take home and will hold it for 3+ years. 2006 Russian River Valley Pinot Noir: $48. Cherry candy, black cherry, tannins, red fruit on the back palate, tart. Blackmail! 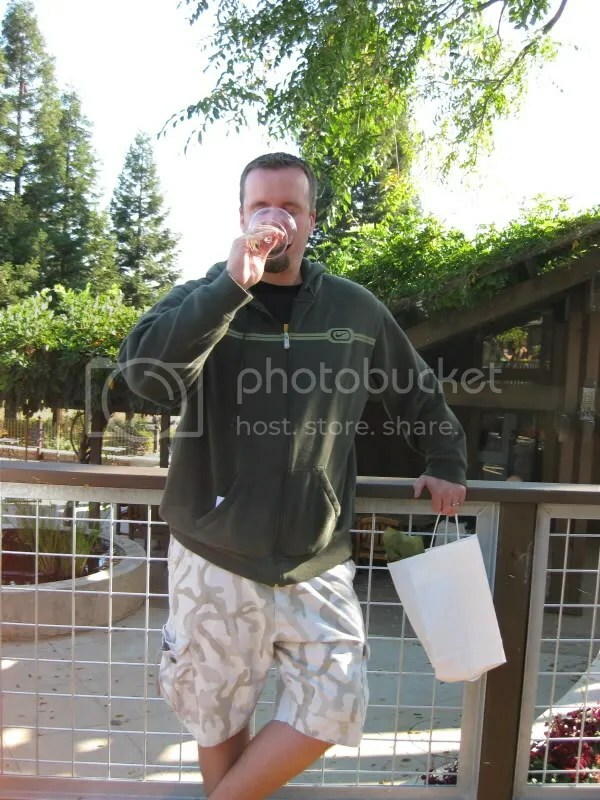 Lenn actually drinks CA wine!